Brands: 1907 Parfums, Aedes de Venustas, Ann Gerard, Baruti, Daniel Josier Parfums, DS&Durga, Eight & Bob, Giovanna Antonelli, Gri Gri, Jardins D’Écrivains, Jovoy, Le Galion, Les Cocottes de Paris, Marc-Antoine BARROIS, Manos Gerakinis Parfums, Mitchell and Peach, Mendittorosa, Olfactive Studio, Paul Schütze London. 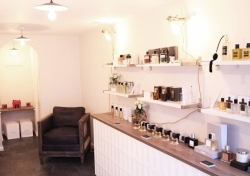 + "Shy Mimosa Perfumery also offers personalized service for Brides and Grooms, to pick a fragrance for their special and most memorable day, which will make them re-live those special moments from their wedding day". Brands: Acqua di Parma, Aromatherapy Associates, Comme des Garcons, Creed, Cowshed, Escentric Molecules, Jo Malone, Laura Mercier, Maison Francis Kurkdjian*, Memo, Robert Piguet, Tom Daxon. Brands: Bella Freud, Cire Trudon**, John Derian, Miller Harris. Brands: at least Atelier Cologne, Creed, Jo Malone.